Published shipping, handling, & insurance charges are for domestic US shipping only. That's what The Quick-Start Guide to SSB Radio Installation and Operation is all about. 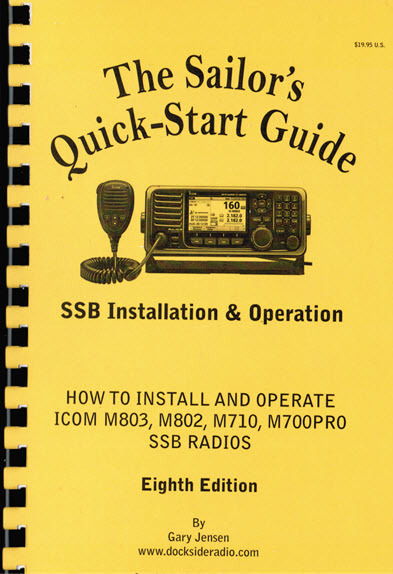 Whether you need help figuring out how to use your SSB, or you're planning on doing your own installation, The Sailors Quick-Start Guide to SSB Radio Installation & Operation has the information you need. Forty pages of focused, actionable information give you the tools you need to make it work. The companion Antenna Tuner for the Icom M802 SSB, the AT-140 matches your backstay, 23-foot or 17-foot vertical antenna to your M802. Two cables are required to connect your AT-140 to your M802; a coaxial cable to carry the radio signals to/from your antenna, and the OPC-II47/N tuner control cable to supply 13.8VDC, DC ground, and tuning status signals. 7212 An XL (1/2" diameter center) genuine FairRite Type-31 snap-on RF choke. Use to help stop shipboard wiring from acting like an antenna, picking up RF from your SSB. RFIK-8 The M802 RFI kit is the first step in the process of reducing/eliminating ship-board Radio Frequency Interference caused by "Common-mode" signals from your SSB radio transmissions. The M802 RFI Kit consists of two genuine FairRite XLType-31 snap-on RF chokes (for installation on the OPC-1147N Antenna Tuner control cable), one Line Isolator (installs inline with the coax cable), a PL-258 double male UHF Coax Connector, and instructions. Note: RFI Kits contain components required in a properly designed SSB radio system. Adding them to an existing installation should help reduce interference to other ship-board electronics caused by your SSB. They are NOT, however, a substitute for proper SSB system design. Neither are they a remedy for poorly functioning antenna and RF ground systems. RFIK-7 The RFIK7 kit is configured to easily install on most Marine and Ham SSB systems. The function of the RFIK7 kit is to prevent the flow of common-mode signals, first step in the process of reducing/eliminating ship-board Radio Frequency Interference from your SSB radio transmissions. RG8x coax jumper with soldered, silver plated, Teflon insulated PL-259 connectors to connect the line isolator to the antenna tuner, and instructions. The GPS-802 Data Cable solves the problem of getting GPS data into your M802. Simply cut the 12-foot cable to the length you need, connect the cable's center conductor to the GPS data out, the shield to GPS signal ground, snap-on the FairRite and you're "good-to-go". The GPSK-802 consists of twelve feet of RG-174 mini-coax with a factory-installed BNC connector that fits your M802 on one end, & bare wire for connecting to the GPS on other end, one snap-on Type-31 FairRite, & an instruction sheet. Digital Selective Calling is discussed in detail on pages 15-42 of the M802 Instruction Manual. What's connected to your DSC antenna connector? If you have an unused coaxial antenna connector on the back of your M802 the answer is nothing. The Icom M802 is actually two separate receivers inside one box; the regular SSB receiver for standard SSB communications, and a dedicated Digital Selective Calling (DSC) receiver. It is this second DSC receiver that continuously listens for DSC calls addressed to your MMSI number (the number you've programmed into your M802). If you don't have an FCC-issued MMSI number already, DockSide Radio can file for one on your behalf - see FCC Licenses on this web site, or call 941.661.4498. METZ WEFAX/DSC antenna with mounting angle bracket. (Mounts similar to VHF whip). 30-feet RG8x coaxial cable with soldered PL259 connectors on each end. ADSP MKII BHI ANEM MKII noise suppressing DSP (Digital Signal Processing) filter with 2.5 watt amplifier, and interconnecting cables. Kit adds an additional fifteen-feet of control head separation cable. Special adaptor connects to the standard separation cable that came with the M802. ???? Questions, Problem's, Issues ???? Didn't buy your SSB from DockSide Radio? Speech compression makes it easier for receiving stations to hear you. Increase your average transmit power - See more Power Bars on your M802. Increasing the volume of a voice's low-energy components. Receiving stations hear you louder. Reduce battery drain: Speech compression works. It increases the M802's average transmit power output. Higher output power draws more current from the batteries. Reduce heat generation: Higher current consumption means the SSB is working harder. More work generates more heat. You supply the boat, antenna, and RF ground - Let DSR's IC-M802k SSB kit do the rest. The Icom M802 comes ready to use on both Marine SSB and Ham/amateur Radio frequencies. The M802's flexible three-piece design makes it easy to install: mount the separate control head & speaker at your nav/helm station where space is scarce, and squirrel-away the main radio unit in a more seldom used locker or cubby hole up to 15-feet (5Meters) away. Both the control head and speaker have a generously wide bezel, making the professional look of an in-panel flush-mount installation a snap, even for skippers who aren't expert wood workers (requires MB-75 flush Mount Kit - must be ordered separately). OPC-1147N tuner control cable (10M - 30+Feet). GPS data cable (12') w/BNC connector & FairRite (DSR exclusive). 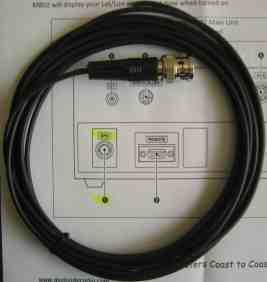 GTO-15 - 20-feet antenna lead-in wire. Copper RF grounding foil (10', heavy-duty .012 thick. Min width 2.75, Max 3-inch Wide - Won't dissolve in your bilge). T-4-500 "common mode" coaxial RF Choke. RF chokes - FairRites (two XL type-31 snap-on ). 1 Call or e-mail your required coax cable length. 2 DockSide Radio does not control the design compromises frequently incorporated into non-standard components & products. Because the outcomes of using non-standard compromises are in many cases indeterminate, DockSide Radio is unable to provide no-charge technical support to self-customized SSB systems that violate generally accepted industry design practices and basic physics. 3The M802 is FCC approved for sale in the US. The M802 is not CE approved, therefore, it should not be fitted to European, Australian, New Zealand, etc., flagged vessels. The lack of CE approval could cause incoming customs authorities to disallow entry of M802's exported from the US into these countries. If you're planning on flush-mounting the control head, you need to add one $31.95 Flush-mount kit to your order. If you're planning on flush-mounting both the control head and speaker, you'll need to add two flush-mount kits to your order. *7%sales tax will be added to sales within Florida. **shipping, handling, & insurance charges are for domestic US shipping only. SSB radios are shipped only to addresses containing a US postal zip code. Modems & Modem Kits are shipped by Insured United Parcel Service (UPS) Ground within the Continental US, and by insured Express Mail to APO's and Territories. Cables and adaptors may be shipped by Priority Mail.